The net volume reduction in Arctic (summer) sea ice, documented in recent studies, has brought with it many predictions of deleterious climate impacts for the region and the globe. The primary concern is the dual impact of a loss of albedo (white ice reflectivity) and greater heat absorption via the exposure of the darker ocean waters to sunlight (which also impacts oxygen levels), possibly leading to a positive feedback (“run away hothouse”) effect. But some, more optimistic, climate researchers have posited a beneficial climate impact from an ice-free Arctic Ocean: greater CO2 absorption enabled by a larger area of exposed ocean. CO2 uptake in the Arctic is indeed highest during the summertime when there is less ice cover. That optimistic view, however, is now being directly challenged by an international team of climate scientists who conducted a high-resolution survey of sea-surface CO2 concentration across the Canada basin. An international team of climate and ocean scientists, led by Wei-Jun Cai (U of Georgia, Athens), predicts that the “Arctic Ocean basin will not become a large atmospheric CO2 sink under ice-free conditions.” Using data from a 2008 high-resolution survey of the entire Canada Basin, the team explains the complex “air-sea flux” and other reasons why sea-surface CO2 continues to increase. Owing to normally high biological production — plankton absorption and metabolizing of CO2 — and low temperatures (note: colder temps mean the water can hold more dissolved CO2), the Arctic Ocean has great potential for CO2 uptake. Indeed, according to a recent estimate (Bates, Mathis, 2009), the Arctic is responsible for 5 – 14% of the world’s CO2 uptake, though it accounts for only 3% of its ocean surface area. This survey, begun in 2008, was an effort to quantify a variable known as partial pressure of CO2 (pco2), and was carried out across the Canada Basin in the western Arctic Ocean. The data collection/analysis has taken nearly two years. This was a region in which extensive melting had already occurred, with temperatures ranging from 0° to 5° C in the Central Canada Basin. This melting of ice in turn causes a decline in the water’s salinity, or salt content–one of many factors that contributes to this complex process. Compared to earlier measurements made in the 1990’s, where nearly every area above 72° N latitude was under ice cover and salinity was above 30%, today’s Arctic Ocean is on average 3° C warmer and 2% less saline. These are significant changes. In climate science, many factors have to be just right to maintain normal conditions; seemingly small shifts can have major, long-term impacts. Such is the case with ice melting. In summer, as sea ice thins, and as open water areas increase, there is a general increase in CO2 removal by plankton. This occurs as part of the biological production process. However, it was discovered that once these same areas become completely ice-free, net biological production levels off (negligible change), and in some cases, can even decrease. The key to understanding what all this data means is understanding a process known as water column mixing, in which deeper, colder waters–aided by wind-blown surface layers– are churned up (along with nutrients for plankton) and mixed with warmer waters (and air) near the surface. The more mixing, the more (nitrogen-rich) nutrients in the water column, the more planktonic growth, and the more carbon is drawn down from the atmosphere. During photosynthesis, phytoplankton— tiny algae – require CO2 to make energy, thus sequestering carbon and providing oxygen in the process. Air-ocean mixing also occurs, in what’s known as ‘gas exchange”, or the air-sea flux, keeping the whole carbon-sink-engine going. Sea surface temperatures (SSTs) rise as atmospheric CO2 increases. Sea ice begins to melt and meltwater inputs to the ocean tend to put a damper on this natural mixing of ocean layers, leading to increased stratification (relatively “static” layers of ocean water). Lower down, less nitrate gets churned up to promote algal growth, and nearer to the surface, the pco2 increases, leading in time to less draw down of CO2 to become available for plankton metabolism*. This increase in stratification may have already shifted the region’s planktonic biota towards the smallest algae, which will also mean less CO2 uptake. In general, the warmer the atmosphere (from more CO2), the warmer the surface layer of the ocean becomes, and the less carbon dioxide gets dissolved in the water (sometimes breaking up into dissolved inorganic carbon, or DIC). However, much CO2 still gets absorbed by surface layers due to the air-sea flux. The main concern is that more CO2 will be converted to carbonic acid, leading to increased acidification which can disrupt the growth cycles of many species of marine plankton. Results of the survey were published in the 30 July, 2010 edition of Science Magazine, under the title: ‘Decrease in the CO2 Uptake Capacity in an Ice-Free Arctic Ocean Basin’, by authors Cai et al. * As planktonic lifeforms grow, get eaten, and/or die, they sink to the bottom, sequestering large loads of carbon in the process. Less total plankton metabolic activity (less “biological production”) means less carbon sequestration. This is a component of the ocean’s “carbon pump”. 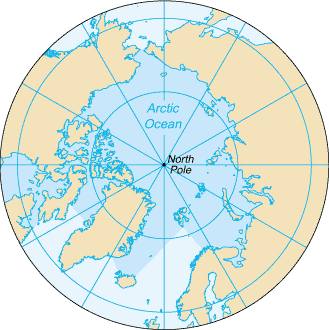 ** On average, the shallow mixed layer depth of the Canada Basin is only 20 meters in the summertime. 14 Fetterer, F., K. Knowles, W. Meier, and M. Savoie. 2002, updated 2009. Sea Ice Index. Boulder, Colorado USA: National Snow and Ice Data Center. Digital media. 15 Zhang, Jinlun and D.A. Rothrock: Modeling global sea ice with a thickness and enthalpy distribution model in generalized curvilinear coordinates, Mon. Wea. Rev. 131(5), 681-697, 2003.